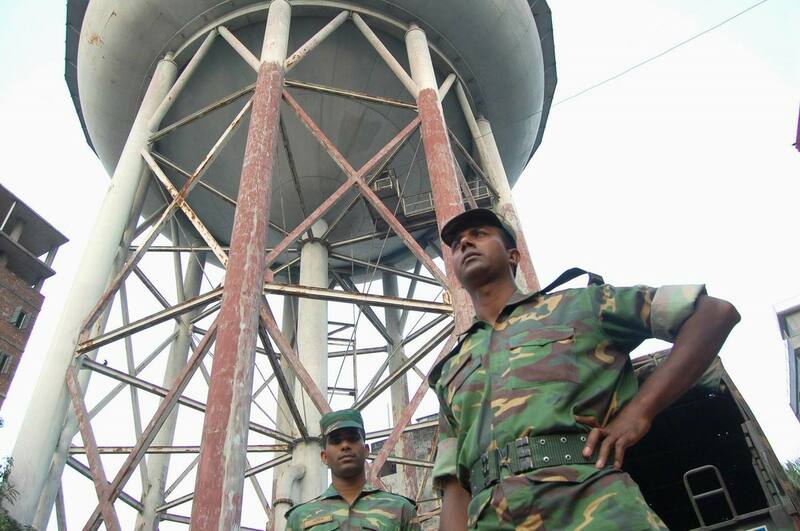 Troops are guarding water pumps in parts of Dhaka as a severe water shortage grips the capital, causing a rise in water-borne diseases, officials say. The move follows angry protests earlier this month by residents over what many see as a deteriorating situation. “The army will work in coordination with the water authority to properly manage water distribution in the city,” Golam Mostafa, chairman of the Dhaka Water Supply and Sewerage Authority (DWASA), told IRIN. Since the end of March, Bangladesh’s largest city has been grappling with an acute water shortage. Water shortages are an annual occurrence during the peak of the dry season in April and May, but have proven particularly bad this year. Regular power shortages due to years of under-investment in electricity infrastructure have made it impossible for the authorities to pump what is needed. At the same time, groundwater levels have dropped due to lack of rain and unusually high temperatures. As a consequence, the city has witnessed a recent spike in water-borne diseases, health experts say. Since 1 April, the International Centre for Diarrhoeal Diseases and Research, Bangladesh (ICDDR, B) has admitted 900-1,000 patients a day, compared to a normal average of 250-300. “Normally, from April to May, we have more patients compared to other times. But for the last two years, the increase started in March,” Azharul Islam Khan, the head of the hospital’s short stay unit, told IRIN. About 87 percent of Dhaka residents receive piped water, mostly from deep tube wells, according to DWASA, with the rest dependent on surface water that is treated. But ongoing power shortages have made it impossible to pump from lower depths what is needed, with an increasing number of residents complaining about the quality and smell of water coming out of their taps. “For the last two months, we have been receiving dirty and bad smelling water,” said Monir Hossain, a resident of Shantibagh sub-district. “Many people have fallen ill after drinking the dirty water,” the 25-year-old said. Dhaka requires 2.2 billion litres of water a day, but can only produce 1.9 billion, according to the country’s national Water Supply and Sewerage Authority. The city has an official population of 12.8 million, but unofficial estimates put the figure at closer to 15 million. DWASA has 545 water pumps throughout the city to pump ground water, but only 293 generators. “We cannot utilize our full production capacity due to a lack of power and a fall in ground water levels this dry season. I hope the crisis will go when there is rain and there are no power outages," said DWASA chairman Mostafa. Some believe the city is already far too dependent on ground water, and needs to change course. “Dependency on ground water is responsible for the crisis… WASA should increase the use of surface water,” Shah Alam Khan, director of the Institute of Water and Flood Management, told IRIN. “The use of ground water is also harmful to the environment,” said Ainun Nishat, a senior adviser on climate change to the International Union for Conservation of Nature (IUCN) Asia Pacific region. According to some estimates, groundwater levels over the last decade have been declining by up to three metres a year. At the current rate of urbanization, experts feel things could worsen if proper steps are not taken now. “When we face a water crisis every year in the dry session, we arrange crisis management steps. But the government should go for a long term solution,” said Nishat. “We have surface water. Why don’t we use the surface water?” he asked. “We should look for the alternative source now. We can use rain water. Also, we can reuse the water we use in the house after treating it,” Khan said. According to the 2010 Global Annual Assessment of Sanitation and Drinking Water by the World Health Organization, more than 30 million people in Bangladesh still do not have access to safe drinking water.